One of the hardest parts of establishing a new business is separating the business' credit from the owner's or officers' personal credit. Initially it may be easier or more convenient for business owners to use their own lines of credit to finance business purchases but eventually the business will need to stand on its own financially. If you are ready to establish credit lines for your business there are business Visa cards that require no personal guarantee. These lines of credit can be difficult to obtain, but with proper preparation it is possible to obtain substantial lines of credit for business use without putting your personal credit on the line. Make sure your business is properly established by registering and licensing your business in your home state. This will increase your chances of being approved for business credit by showing potential creditors that your business is legitimate. In addition to registering and licensing your business use the IRS website to request an EIN (employer identification number) free of charge and contact Dun and Bradstreet to obtain a free DUNS number. Both of these numbers will be used by creditors to pull your business credit file. Lastly, contact your local phone company and set up a land line for your business and have it listed in your local phone book. This will help creditors verify your business location and will give you a utility bill to show any creditor that requests one. Open a business checking account at your local bank or credit union. This will help you to further separate your personal and business accounts, while giving potential creditors a verifiable bank reference. Be prepared to provide a copy of your business license or EIN to the bank in order to open an account. If you have a corporation, the bank may require copies of your business' articles of incorporation. Start opening small credit accounts that are revolving or have NET 30 terms. Accounts with NET 30 or NET 15 terms require that the account be paid in full every 30 or 15 days and are often easier to get. These accounts will report to your business credit file and will help build your business credit. A few companies that offer NET 30 and small lines of revolving credit are Kinkos, DHL, Ulines, Viking and Northern Tool. Apply for a line of credit with a company backed by a major credit issuer such as Citibank or GE Money Bank. Obtaining an account that is affiliated with a major bank will greatly increase your business credit standing by showing that these major financial institutions consider your business to be credit worthy. Credit accounts to consider are the Home Depot commercial credit account (Citi) or the Amazon.com commercial credit account (GE). 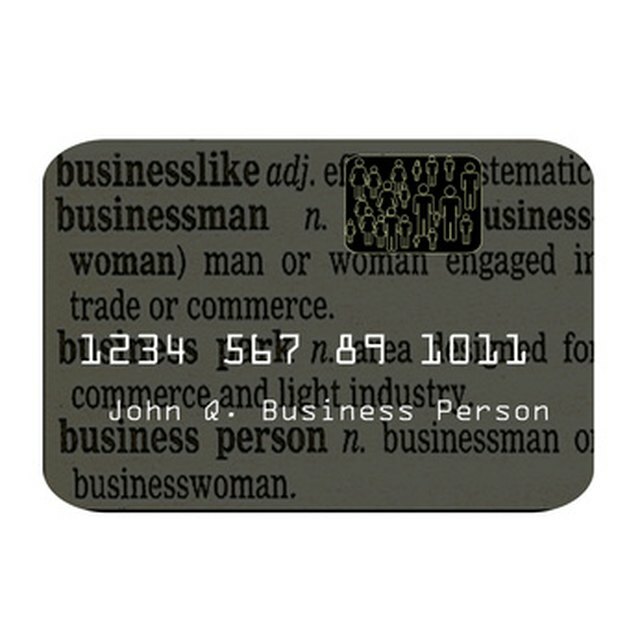 Contact your business or personal bank account and ask about business Visa cards. Ask whether or not they require a personal guarantor. Many banks will recommend that you add a personal guarantor to increase your chances of getting approved, but few will require it. When you start obtaining applications, review them carefully. If the application requests a personal guarantor and states that the personal guarantor's credit report will be pulled, move on to the next application. Focus on applying for business Visa cards with companies like Key Bank that will request a personal guarantor, but do not require it or will not pull a personal credit report.